UFC ‘Denver’ Clash: Cerrone Vs. Perry! Ultimate Fighting Championship (UFC) Welterweight scrappers Donald Cerrone and Mike Perry will collide this Saturday (Nov. 10, 2018) at UFC Fight Night 139 inside Pepsi Center in Denver, Colorado. The Jackson-Winkeljohn Academy and an older fighter being pushed out by a younger one, name a more iconic duo? Cerrone is the latest in the line of long-time, established members of the Jackson-Wink Team being made uncomfortable by a younger contender joining his camp’s ranks. Cerrone has stuck to his own training since, and it’ll be his first fight back since the controversy. Unusually, the fight between the old vet and gym newcomer is happening right away this time, and Perry fills the role of prospect. I’ve been a believer in Perry’s potential almost since the beginning, but some disappointing performances hampered by his lack of a real camp really hurt. Cerrone problems or no, this move to Jackson-Wink had to happen. Keys to Victory: Cerrone has accomplished some great things in UFC’s Octagon even without ever capturing the title. The Muay Thai fighter has kicked apart and strangled dozens of foes over the years, and even if he has lost a step, Cerrone is still a dangerous combatant. Perry is undoubtedly growing on a technical level, but his base style remains the same: Perry likes to walk down foes and throw hammers. No matter how much better Perry gets at that style, there will always be counterattacks. Luckily, Cerrone is quite good at a number of them, namely his snap kick and intercepting knee, two strikes which serve to prevent opponents from closing the distance. In addition, I’d really like to see Cerrone commit to his low kicks. Perry chases like a boxer, oftentimes leaving his lead leg vulnerable. After a few low kicks, he’s suddenly much slower, which should give Cerrone the extra bit of time needed to avoid getting caught up in the pocket by Perry. Keys to Victory: Perry has long shown great natural gifts — namely brute power and an inherent gift for destruction — but his last fight was really the first to show true technical growth. Perry kicked more than before and did so with purpose, and his general movement was focused more on setting up power strikes than simply throwing them. Opposite Cerrone, Perry will be forced to navigate the waters of range without getting kicked into submission. Hopefully, he won’t try to bull-rush straight forward, which would leave him vulnerable to soul-sapping intercepting blows to the belly. Instead, I’d like to see Perry willing to kick with Cerrone. Trading round kicks with Cerrone is a bad idea, but using quick inside kicks like he did opposite Ellenberger and jamming the lead leg would not be. Following an exchange of kicks would be a great moment for Perry to close distance and punch. Cutting off the cage is also very important for “Platinum.” If Cerrone’s back is to the fence, his kicks are ineffective, and he’ll be forced to rely on his historically iffy head movement to survive Perry’s fury. That’s really where Perry wants this fight, and his ability to stop Cerrone from circling will decide if it happens. Bottom Line: It’s going to a be a bloody war. 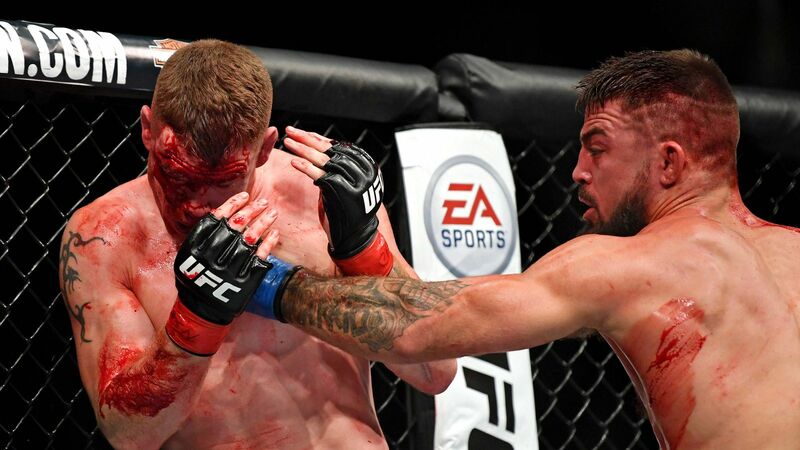 Cerrone has been locked in the cage with plenty of men like Mike Perry in the past, and he generally wins. However, there’s a pair of asterisks that go along with that statement: Cerrone is a bit older now, and there are very few men quite like Perry in terms of raw savagery. It’s a dangerous contest for Cerrone, one where his veteran knowledge could shine through and fail to keep him safe. It would certainly be a valuable victory though, something “Cowboy” needs right now. Perry also needs consistent wins right now. He’s still pulling big name foes and co-main event slots because of his entertaining persona and bloody fight style, but that’s hardly Perry’s sole goal. “Platinum” has called out plenty of top contenders, which can only happen if Perry wins fights like these and builds up his UFC record. At UFC Fight Night 139, Donald Cerrone and Mike Perry will go to war. Which man will remain standing when the dust settles? What Is the Scandi Sense Diet?